When Nadia’s pastor, Peter Constantin, asked her to attend a training to learn how to make jewelry, she quickly obliged. This mama of six children knew she could use the extra income to help support her family, and she was eager to be a part of the project. 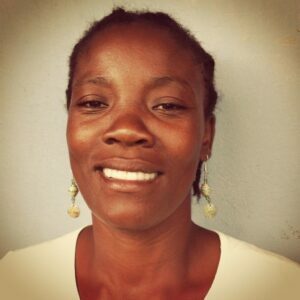 Nadia was trained as the first leader for the group of artisans in Pignon. She and another woman from her church, Moise, went to Port Au Prince to learn the technique of making beads from recycled cardboard. Shelley Clay and the ladies of the ApParent Project generously shared their skills and then set Nadia and Moise free to teach others in the Northern mountains of Haiti. Peter appointed Nadia to set up a little space where the women of the church to gather, learn and share supplies. Today the leadership team has grown to a committee of five who help with the 35-some artisans working in Pignon. Nadia recently perfected the art of making Christmas star ornaments. These ornaments were released for Christmas 2012. These ornaments make unique gifts to share with teachers, friends or as hostess gifts. Nadia’s most quality work is showcased in her long layering necklaces (pictured above).